Please do NOT be offended if this is your favorite gemstone. This merely MY experience with it. OHMEGERD - what a CHALLENGE! So, I signed up for this great little challenge called "Gems and Metals" - I would be sent a package of pre-selected, random gemtones and a chosen metal. I was VERY excited. I hadn't done one like this before and had visions of sodalite, amazonite, pietersite and mookaite dancing in my head. Would I get gold, silver...copper? I was SO excited when the package came...I KNEW this was my big moment......I anxiously ripped that envelope open and to my shock and awe - I found...... what the?! What IS that?! I ain't never seen THAT before...what IS it? RED AVENTURINE - in my eyes - baby food orange.......ew. What the BLEEP am I gonna do with THAT?!!?!? So, after I recomposed myself - I'm not gonna lie....it took a few weeks....I finally pulled out my baby food. 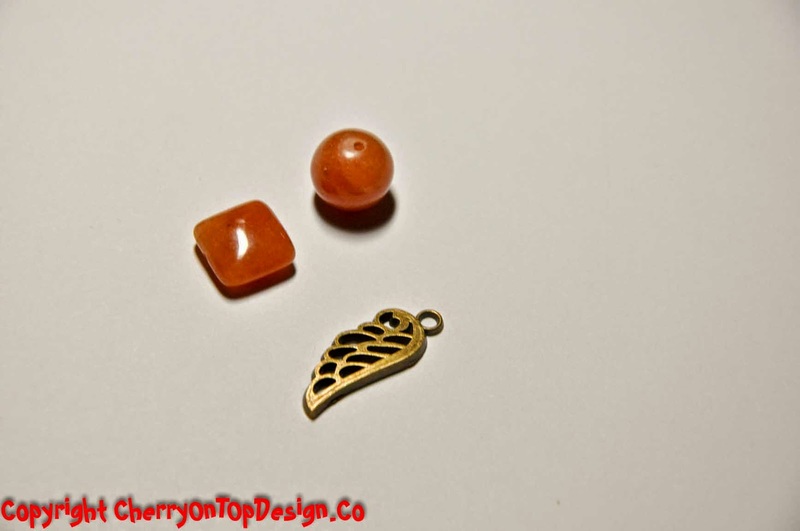 In the meantime, I went to a trade show and picked up some fun new beads.... not even considering my red aventurine. It was home and I was HAPPY! As time continued to pass by, I just kept shaking my head going - what am I gonna do with that?!!? Time was closing in quickly and while I was putting my new beads away, I came upon my challenge.... and decided that perhaps it was time to pull out the "big guns" - a color wheel. I know - crazy, right!? 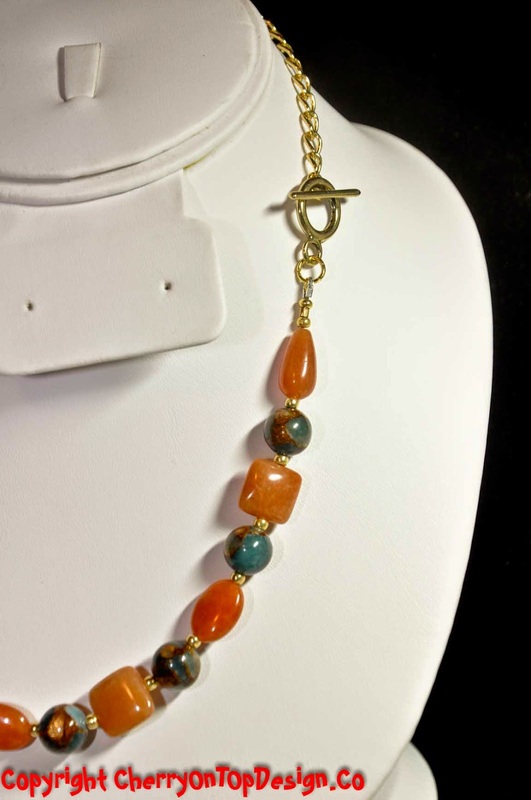 The color is very red-orange.....and compliments to it include blues, purples and greens. So, at least I had a jumping off point - somewhere to begin. On a whim, I held up my new aqua quartz and HOLY SCHAMOLY it looked AMAZING!! 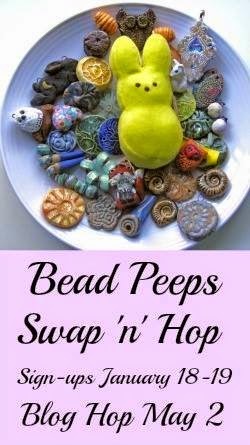 Ok, I'm on to something here..... so I went through my spacer beads and had 0 that were bright gold (remember the metal I was given was an antique brass color) - so I found some seed beads I had and they were PERFECTION! I'm actually surprised at how much I like this piece.... considering all it had going against it. ;) It needed a little jazz , so I went a little crazy with the filigree connections..... it took some time to get it figured out and in the process.... this came out - which I kinda LOVE =) Hot, right?! But this is how it ended up and frankly - I LOVE this piece. As a side story: A dear friend had come over one day and asked me if I had any new challenge things I was working on....I mentioned my "UGH Red Aventurine" and after talking about it for a while...I ended up showing her my start (which at the time was the first piece with the aqua) and I REALLY loved the way it was shaping up. She nearly brought tears to my eyes when she said that even though it wasn't something that I'd have chosen on my own, I knew how to elevate it and make it gorgeous - really - I about lost it. I was so humbled and thankful for her encouragement. <3 you, girl! 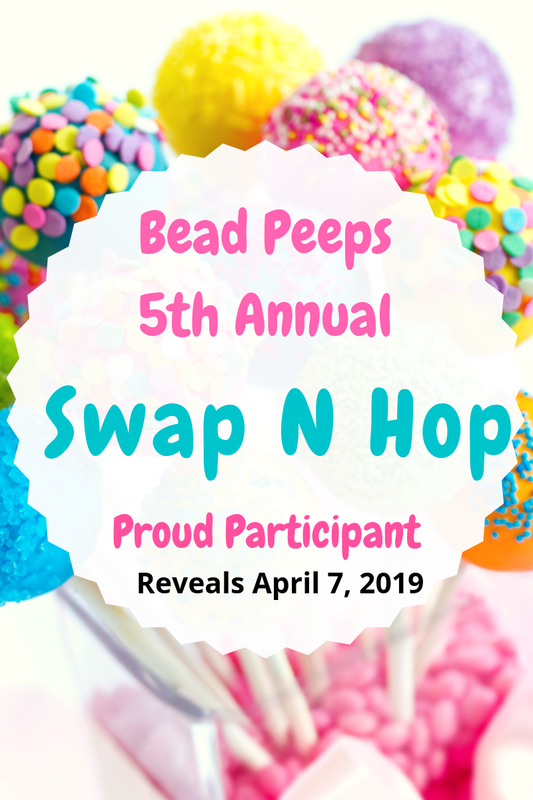 Be sure to leave a comment on what you thought, and don’t forget to visit all of the wonderful other artists in this fun blog hop! 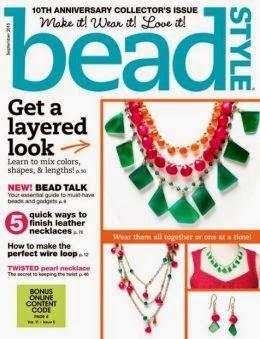 I agree with your friend --those contrast beads in the first necklace are just perfect to compliment the jasper. Nice job! you created some beautiful pieces!I got the same stone and was also like what am i gonna do with this!! it didnt talk to me for a long time. 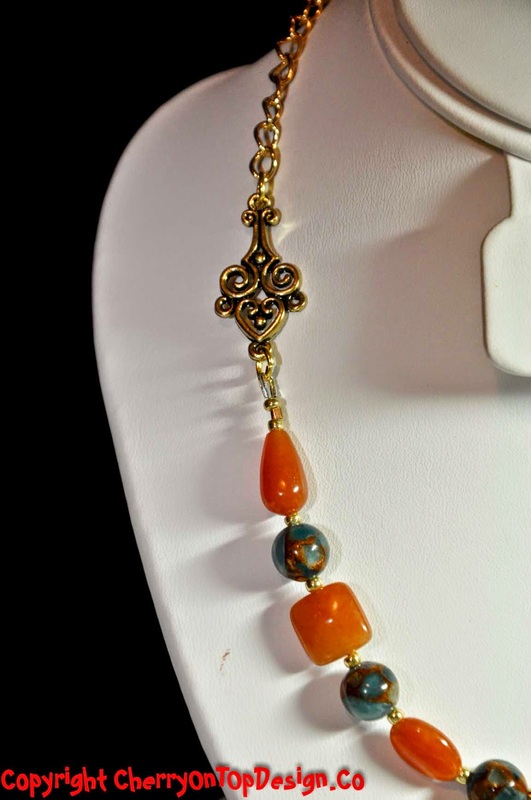 then a friend placed some beautiful turquoise beads with it and it was an moment of ahhhhhhhhh that will work!! it needs bright color!! so i created! 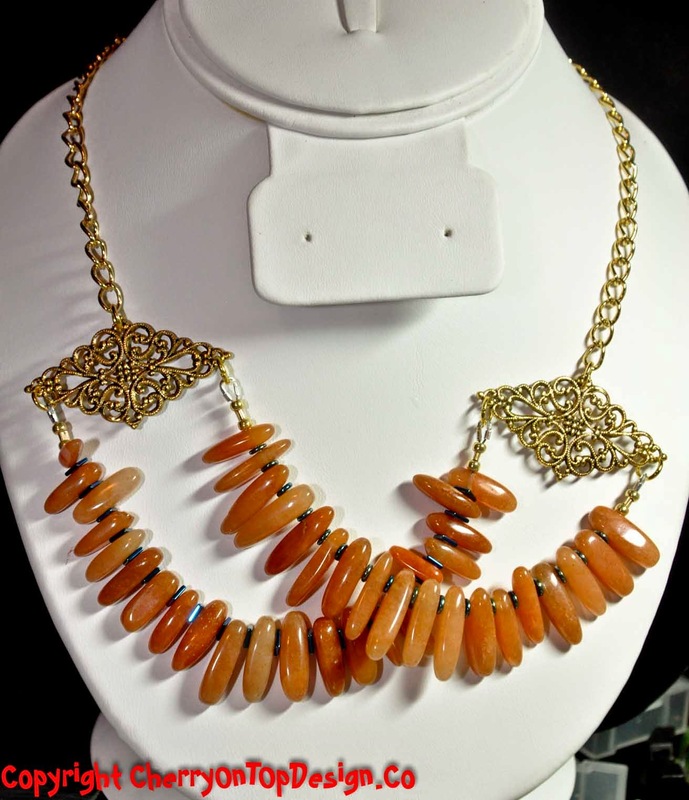 You conquered the challenge really nicely, the first necklace is really neat and I love the design of the second one. Love what you wrote and what you made. I can see where a color wheel helps make or break the contrast color. 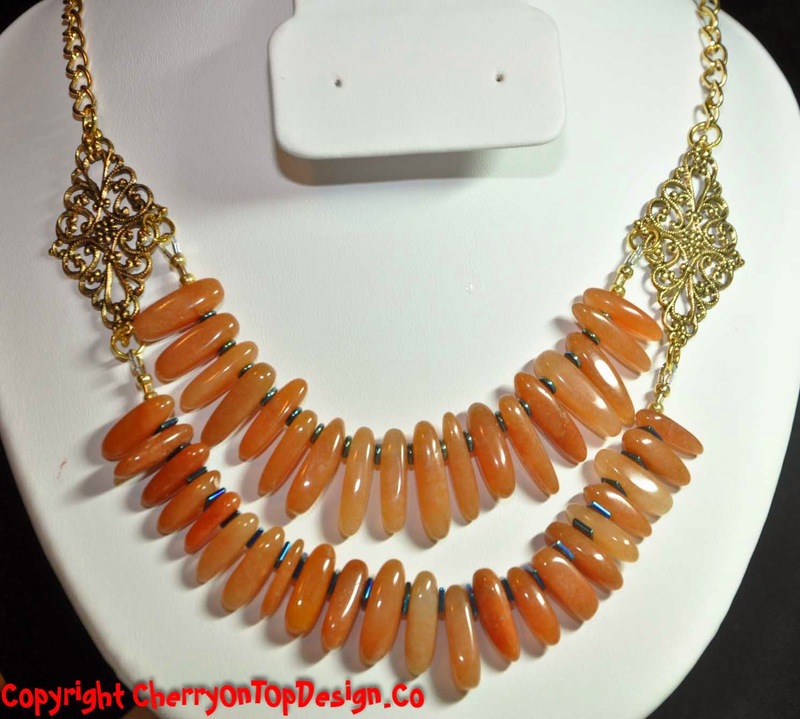 Great idea to add the aqua quartz to the red aventurine, Linda! You rose up to the challenge and created very nice pieces. I really love the "sticks" necklace too. I think I will consult the color wheel next time I am stuck. Thanks for being in the hop! You did a GREAT job with the Gemstones...I love your sense of humor about your initial reaction. The pieces turned out great. I have to say though, for me, I love the criss cross draping of the sticks. Both are Amazing. Thanks for sharing. LMAO....love how you started your post....i KNEW you could do it. really adore that second design, great job Linda! Enjoyed your post and your challenge. I like what you did with the daggers and hopefully you made the piece to be worn both the ways that you showed. Hi Linda, Good post. The aqua looks great with the red adventurine and I like the clasp on the side instead of the back. The second attempt with the tusks is much better than the first. Using the color wheel is what you are supposed to do when you are stumped. You pulled this design challenge off nicely. Love that you met the challenge of your kit. It is one of the reasons I enjoy doing these blog hops. You often end up working outside your comfort zone or trying something new. Your finished designs are wonderful. For not liking it much you sure went to town!!! I think you did a marvelous job!!! Have a Blessed Day!!! I totally understand the dilemma that you felt you had when you received your kit. We've all been there, totally stumped. Sometimes it takes a bit longer in designing with what we are given. But that is why many of us enjoy joining these challenges. I agree with Robin, the beads simmered and then you went to town. Heck, I'm still working on my Carnival challenge. I made one simple piece right of the bat when I received my Carnival kit only using 4 beads. I'm in the process of a few other ideas. This is a great post! I loved reading about your creating process! You definitely succeeded in your challenge your pieces are stunning ! So gorgeous colors! Great pieces! I enjoyed your post taking us through the process. 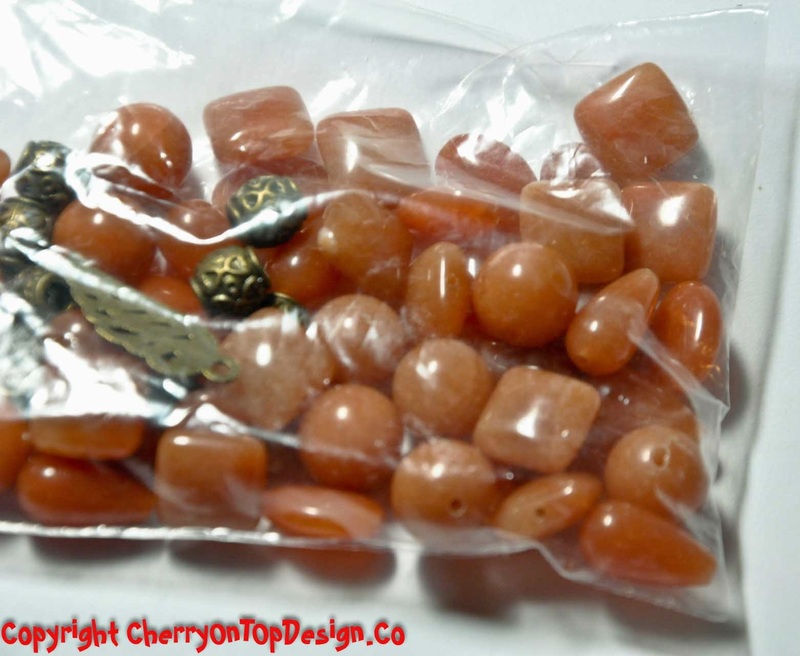 And I learned about red aventurine! Hahaha! Baby food orange. You kill me. This was a hoot to read, and your designs are fabulous. 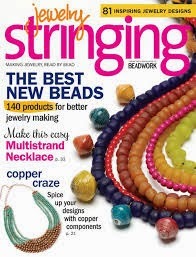 You made those beads work for you and created two lovely wearable pieces. Congrats on overcoming your challenge. Ain't it great to push yourself into coming up with fantastic pieces. That is what the challenges are really about. You deserve a big scoop of baby Mellon mush for those 2 killer pieces. 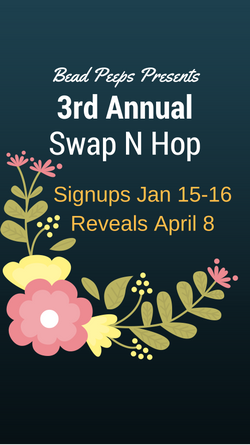 The best part of a blog hop is the challenge. You did a great job with your pretty stones. 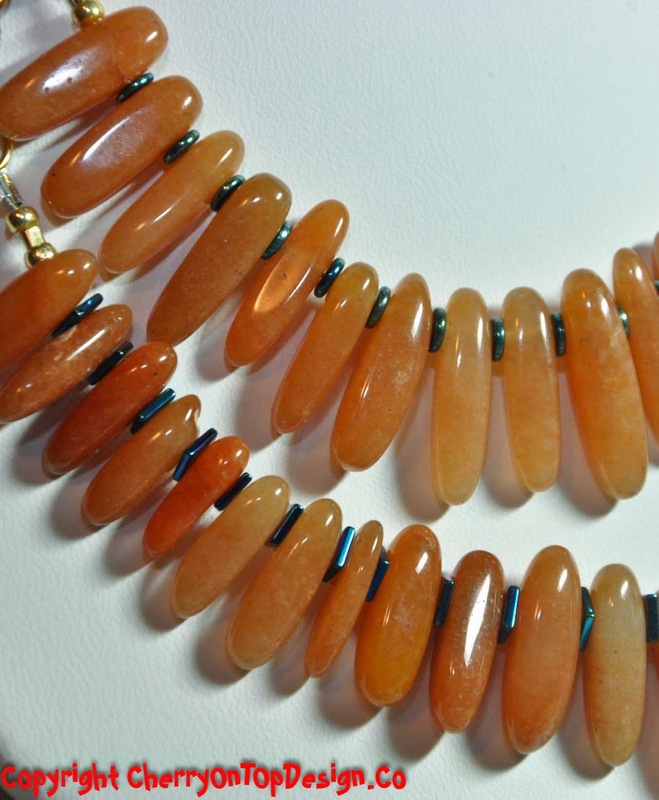 You may not love red aventurine but combining it with aqua, green and blue was a genius move. 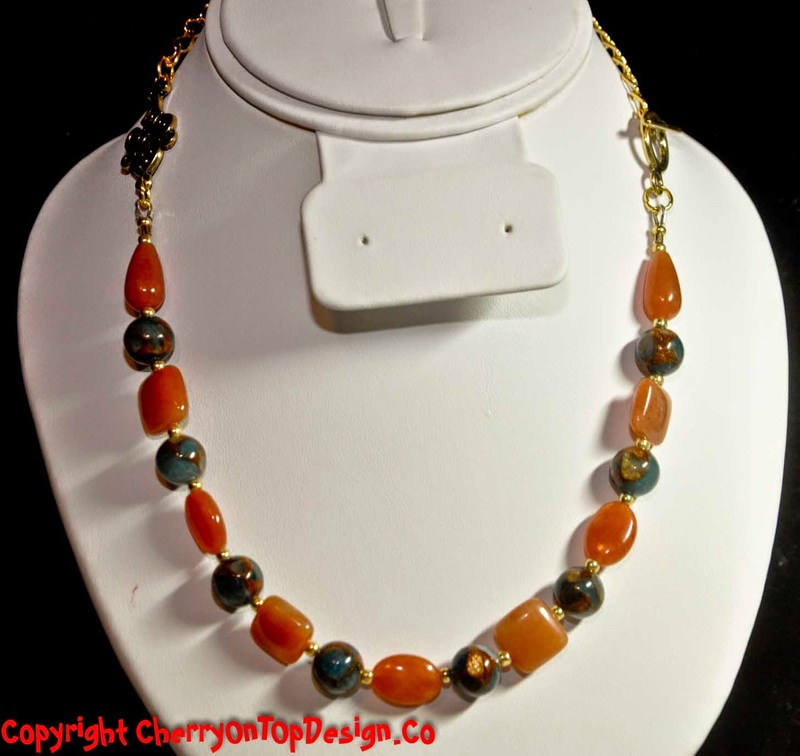 All those colours brighten it up and at the same time show depth in the stone. Your designs are great.....Well done! Well you may not have love the red aventurine...but I agree with everyone else...you did a great job. I really liked the way you used the spike in the first way....kinda hippie, 60ish looking....like the second way too. But love the first way better. Great job. Thanks for sharing! What a great post! Had me chuckling more then once. And I love how you overcame your issues and made up two gorgeous designs.